I'm not even certain whose piss this is, let alone what it might be used for! My last post finished with me investigating the doctor’s house where Phil had recently murdered a slave and the doctor himself. I’d collected urine in my flask from the sample on the desk and also found a letter on the doctor that went some way to explaining the Orbs' purpose on Earth. The letter was signed off by someone named N. Goring, and given the author had talked about his “creations”, I’d figured it was likely to be the man in the newspaper clipping I collected way back at the start of the game. 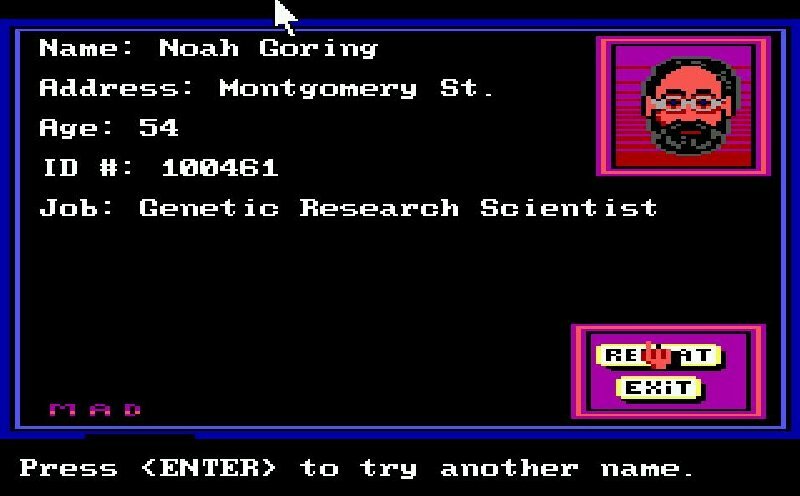 His name in the article was Noah G., so I opened up my MAD and typed in “noah goring” to see whether I was right. I was, and I was rewarded with the profile of the scientist behind all the genetic experimentation, including his address! I had no hesitation in bring up the map and heading straight over to his house to see what I could find. My exploration of Noah’s apartment revealed quite a few things of note. Firstly, when I looked through the window I could see Coit Tower, Alcatraz Island and a building called Julius Castle! Could this be the castle that would turn out to be “the Gateway to Hell”? I could only assume so! Unfortunately just seeing it through the window was unlikely to put it on the map so I could visit it, but at least I knew what to look out for. On the table in the apartment was a pack of matches and a white thread and needle. 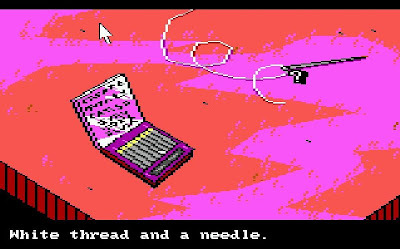 I was able to pick up the matches, but not the thread and needle, which seemed odd. When I looked at the matches, I could see that there was one missing, and the writing on the inside said “Comments to the authors can be sent to: Everyware Dept. MH 2 Box 5204 Olympia, WA 98503”. I assumed that the matches would serve another purpose other than as a contact advertisement, but couldn’t think of any at the time. Well now I know where it is, can't I just walk on over there? Before I could put the matches into my robe, I was shown a rather unusual cut scene. In an underground cavern, a mutant sat upon a throne made out of a car, with bikini clad mutants sitting alongside him. The crown on his head and the cape around his shoulders suggested that this was the king of the mutants, and he had some sort of device in his hand which he waved around in triumph. 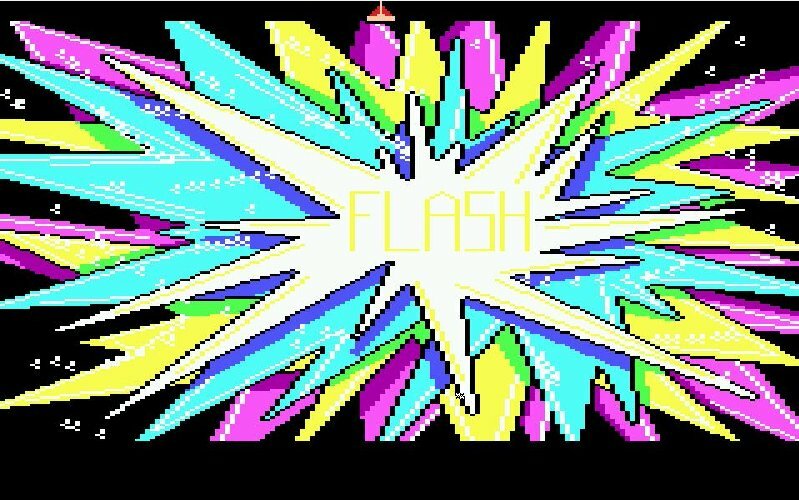 All of a sudden Phil came charging into the room and stabbed the king to death with a large knife while numerous mutants simply watched. He then picked up the crown and placed it upon his own head, then picked up the device. The Murry’s appeared on screen with the message: “The Rats call Phil King and that’s a bad thing. 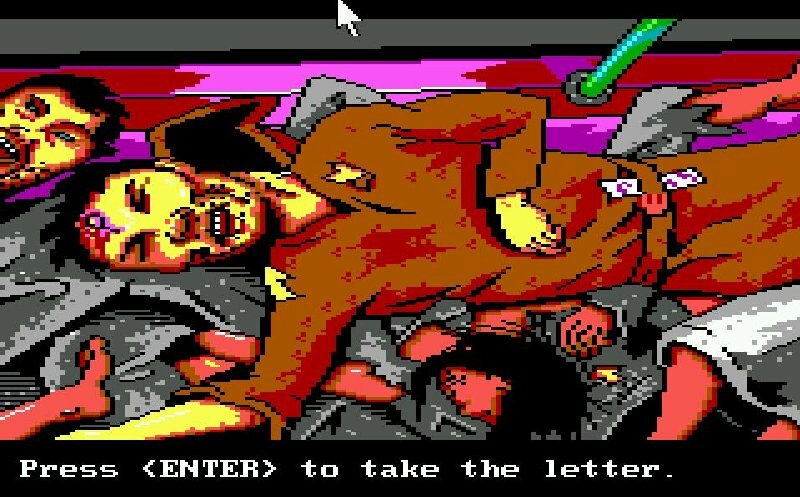 He came out of the sewer, now he has the Viewer!” I have to say that this whole cut scene was pretty damn laughable, with horrible graphics and animation, not to mention how awful the little “poem” was at the end. Still, it got the point across, and gave me some new information to chew on! Am I supposed to think that Noah left in a rush or that someone has broken in and gone through his stuff? Hmmmm... 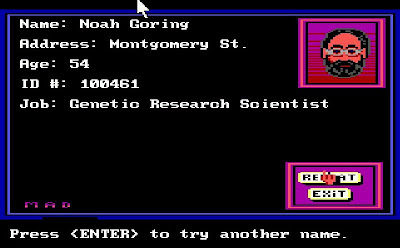 So Noah Goring was creating mutants to help the Orbs do whatever it is they’re doing beneath the Earth’s surface. Noah’s letter I found on the doctor suggested their aim was to kill the Earth so that they could live, but I knew no more than that at this stage. At some point Noah had begun regretting his work for the Orbs and begun trying to save mankind, and the letter also suggested that the Orb’s suspected that he had “the card”. I don’t know what the card might be, but it’s obviously important to the Orbs and Noah had intended to deliver it to the doctor. Could it have something to do with the slave that was “delivered” to the doctor? I couldn’t see how, but it might be worth another look at some point. Perhaps it was what Phil was after when he raided the doctor’s home and killed both he and the slave! Man, this game really drip-feeds information to the player! Before I left the scientist’s house, I tried using a few items with the needle and thread. I doubt it’s there for no reason at all, but I had no luck with anything in my inventory at the time. I then opened up my MAD and checked the tracker recording to see where the two suspects that left the slave at the doctor’s house went next. Interestingly, they split up shortly afterwards, just as a third marker entered the screen at high speed. The marker I was viewing left the screen just as the other two markers were about to collide, but I decided to see where the one I had would end up for now. As soon as I saw that its next destination was a laundry, I got pretty excited. 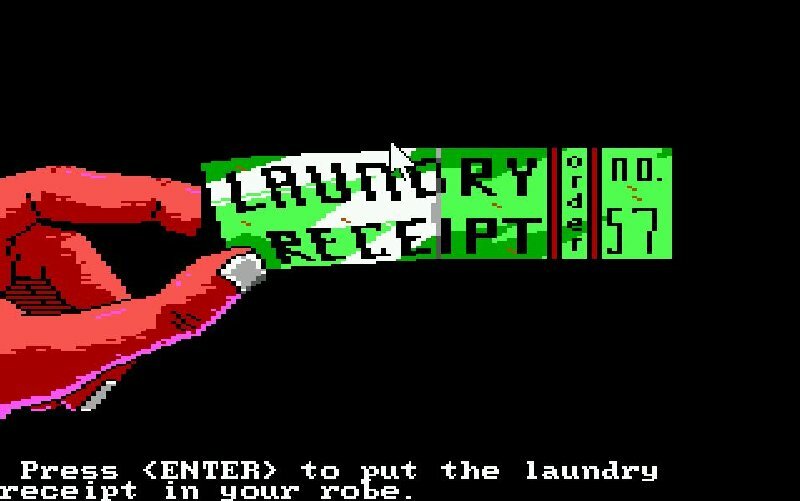 Finally I was going to have a place that I can use the laundry receipt I’d picked up outside the Bank of Canton on Day 1. The suspect entered the laundry and joined up with two other people inside. It was here that the target movement ended, so I brought up my map and eagerly made my way to the laundry to see what happened there. A laundry! Could this be an obvious puzzle solution!? On arrival I was very disappointed to find that the laundry was closed. I’d figured I would be able to break in somehow, but my pixel hunting revealed nothing and I wasn’t able to use any of my items on the door (including my mallet). It appeared that whatever I was going to do at the laundry wasn’t going to happen just yet. I therefore opened up my MAD and ran through the tracker recording, this time switching to the second suspect prior to reaching the doctor’s house. As expected, the two suspects separated shortly after leaving the house, and the third marker entered the screen and raced towards my current marker. Just before the two markers collided, my suspect entered a cable car barn. Apparently on a cable car, the suspect marker followed what I assumed was a track, before jumping off and spending some time in front of one of the nine boxes held within some sort of boundary. After a short amount a time, an opening appeared in the boundary which the suspect moved through. Hmmmm...what did he do to cause that opening in the boundary? The suspect then spent some time standing in front of what looked like a stationary cable car, at which point a slave entered the room, interacted with the suspect, and then exited through the opening they’d originated from. At the same time as this took place, the red marker I’d seen racing across the screen outside entered the cable car barn and got into a scuffle with the suspect. Clearly the victor of the confrontation, this marker (which I assumed was Phil) left the suspect I was following in the cable car and then left the barn. 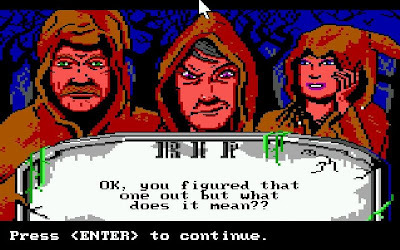 The recording stopped at this point, so I brought up my map and went straight to the cable car barn to try and figure out what the hell just happened! Standing outside the barn, I had two entrances to choose from, being a set of glass doors and an archway through which I could see the cable cars passing by. I chose the glass doors, through which I could watch what was going on within the large room. I watched as the cable car followed the track through the room while robots whizzed around dangerously. I noticed that the robots stopped to let the car pass whenever it was near, but other than that I could find nothing of interest to do or see through this entrance. 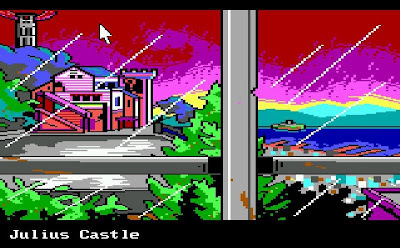 I left the room and entered the archway, which caused my character to hop on the cable car and begin the route through the room. If I stayed on the car long enough, it would simply pass back out of the barn, leaving me standing outside, so I was going to have to hop off at some point. 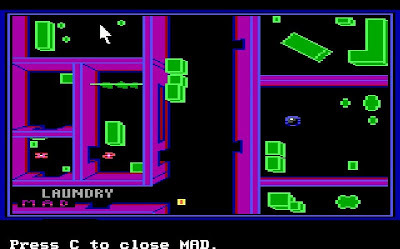 I soon found out that touching any of the orange sections of the screen, including the rectangular boundary, fried me, so I was going to have to figure out what the suspect did to make the opening in the boundary appear. After a few failed attempts I made it to the box that the suspect had interacted with, at which point my view changed to a singular large lever. Pulling the lever opened up the section in the boundary, and I raced through without getting hit by one of the robots. As soon as I was through, my character automatically moved up to the stationary car that the suspect had visited, and eventually been left in. I'm assuming that writing says "London". It could be anything! If my guess was correct, this note was given to the dragon member by the slave, which meant the slaves wanted to be taken to Hell (which I figured would be accessed from within Julius Castle) and that they could help stop the Orbs from achieving their goal. It also seemed likely that the slave I saved from captivity might be the key once I got to that point, but despite having a pretty good idea of what was going to happen later, I was going to have to follow other leads first. 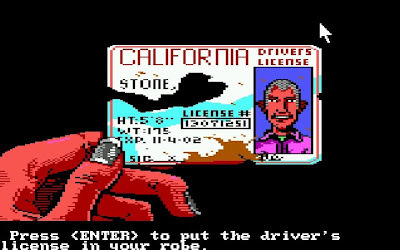 That meant loading up my tracker recording and watching to see where Phil Cook went after he murdered the suspect in the cable car barn. I really hope that following him will open up other leads for me, as I’m rapidly running out. 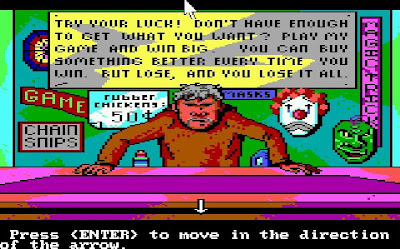 I’m still very intrigued by Manhunter 2! It’s more complicated than the first game for sure, but I’m enjoying the challenge. I still have that feeling that I’ll be completely stuck any moment now, but am making progress nonetheless. I’m about to get back to it, so here’s hoping for another successful session. Note Regarding Spoilers and Companion Assist Points: I've written a set of rules regarding spoilers and companion assist points. Please read it here before making any comments that could be considered a spoiler in any way. The short of it is that no points will be given for hints or spoilers given in advance of me requiring one. Please...try not to spoil any part of the game for me...unless I really obviously need the help...or I specifically request assistance. In this instance, I've not made any requests for assistance. Thanks! The Temple: Where everything starts to get a bit weird! My last post finished with a strange occurrence on the staircase in the temple. After rubbing the jewel on the statue with the cloth (that told me to “rub jewel of heaven”), I witnessed a vision of an F, an oar shaped object, a P, and finally a ruler. It didn’t mean anything to me, so after a bit more investigation, I made my way up the stairs for the first time. Once I reached the top I entered a room that had a green dragon head coming out of the wall. 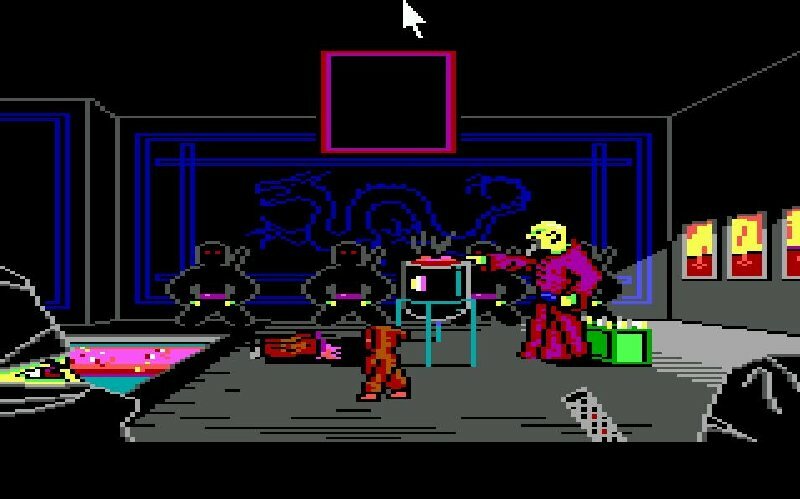 I immediately thought of the Dragon gang that Tad Timov had been part of before his death, but that thought was temporarily forgotten as a bunch of ninjas surrounded me. At least they looked like ninjas! One of them forced me away from the dragon head and then kicked me off the screen onto a rather slippery pink bridge. Damn ninjas came out of nowhere! 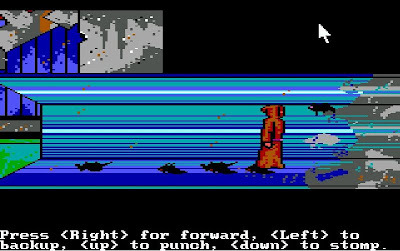 Before I even realised that I was taking part in yet another arcade mini-game, I found myself off the bridge and submerged in acid! The Murry’s took glee in telling me how it’s “remarkable how fast acid dissolves flesh!” I then spent the next couple of minutes trying to guide my manhunter across the bridge while he slipped all over the place. Once I made it across I was confronted by a large bearded man overseeing a normally robed man getting the dragon symbol tattooed on his hand. Tattooed isn’t the right word though. This was a branding, pure and simple! The robed man then very proudly displayed his new marking to me before collecting a scroll and walking off. The bearded man then pointed in my direction; clearly suggesting that it was now my turn to put my hand into the fire. Is this the suspect that entered the temple or just another guy? I must have paused for just a bit too long while I decided what to do, as one of the ninjas pulled out his sword and sliced me in half! Rather unexpectedly, my upper torso hopped up onto its hands and “walked” back over to my legs, reconnecting the two parts! As if this wasn’t ridiculous enough, my character then realised that he’d reconnected his two halves back the front, and spent some time readjusting. Once all that was done, I was given another opportunity to brand myself, so I went ahead and did it. 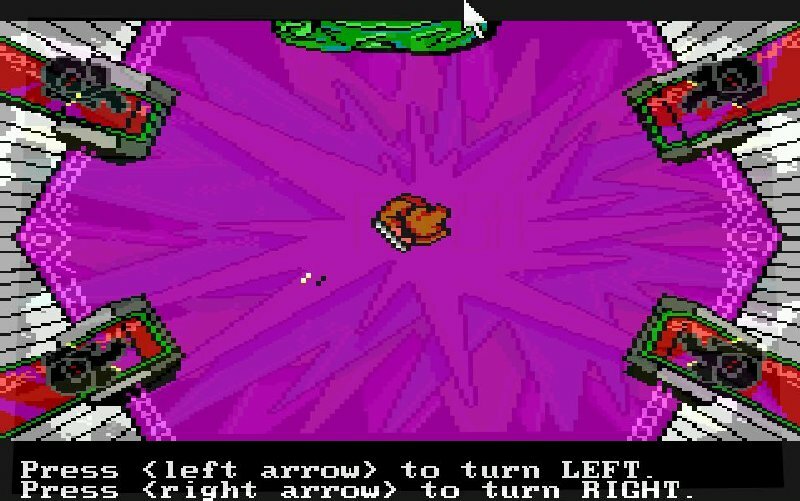 As soon as my hand touched the burning hot dragon symbol, my character cowered in pain and ran around the room, eventually falling in the acid! I restored and pondered what else I might be able to try. I had nothing in my inventory that could help me get the branding without the pain, and attempting to pick up the scroll without going through the ritual also resulted in a sword through the guts. Tis nothing but a flesh wound! In the end I decided to restore back to the staircase and go check out where the other suspect went. Perhaps I would find something down the track to help me get through this ordeal! After leaving the temple, I made my way to the right of screen where I knew there was another location to investigate. There I discovered a red door, which led to a room containing a meditating old man, sitting in front of five jars and a pipe. Interestingly, each of the jars had symbols on them, and I recognised the symbols for Heaven and Vision that I’d seen in Tad’s apartment. 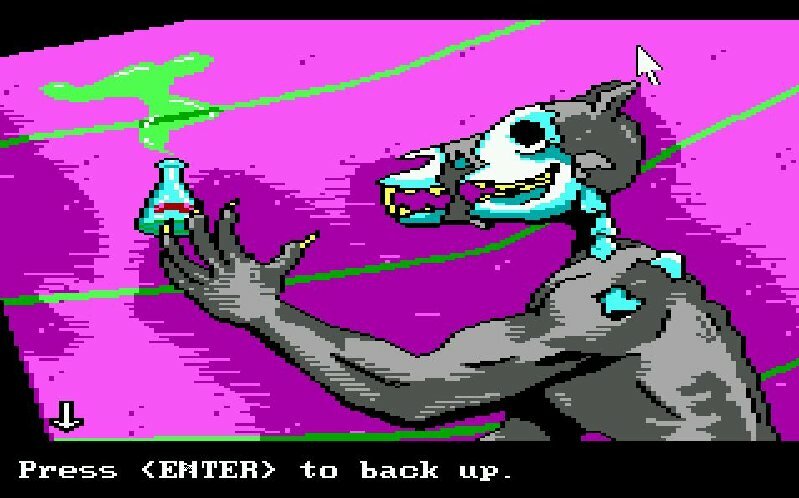 I soon discovered that I could take pinches of whatever was in each of the jars and put them into the pipe. I could then use the pipe, which would light it. Clearly I was going to have to choose the correct material to put in the pipe in the right order before lighting it, but how was I supposed to know what that order was? The banner I’d seen earlier had to be a clue, so I pulled up a screenshot and studied it. The symbols on the banner did indeed match the ones on two of the jars, but no matter which order I placed them in the pipe, nothing happened when I lit it. Was there another one of these banners elsewhere in the game that would let me know what the other jars represented? Was there a sentence I was supposed to form by selecting the right jars in the right order? 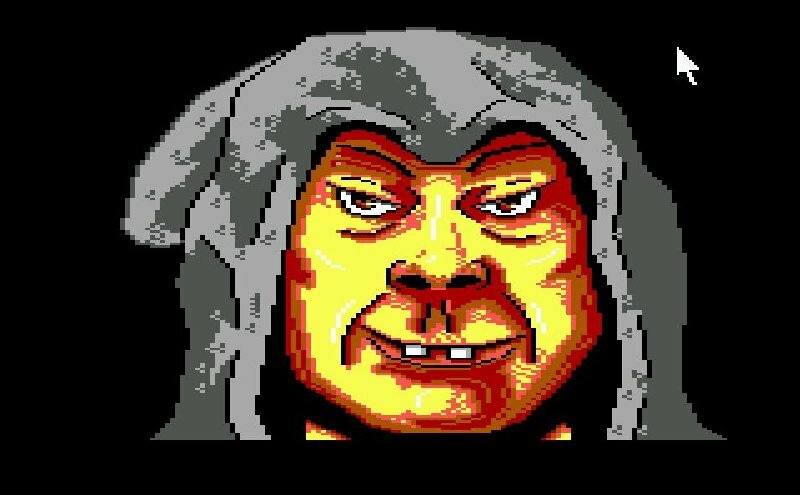 I thought about everything I’d seen earlier, but other than “The Castle is the Gateway to Hell”, I could come up with nothing. That clue wasn’t going to help, as I didn’t know if any of the jars represented those words, and any thoughts of trying to guess the correct combination were forgotten as soon as I realised I didn’t even know how many pinches I needed to put in the pipe before lighting it. Once again I was going to have to move on and hope another clue was forthcoming. I now know nothing...which is no less or more than I knew before. I opened up my tracker recording and changed to the second suspect while at the pier. Once the first suspect went off to enter the temple, the second one continued on, eventually entering a shop. Another marker appeared on the screen at this point, and after my suspect departed the shop they united on the footpath and carried on together. I exited the tracker at this point to go check out the shop. I pixel hunted outside it for a while but found nothing, so attempted to enter. I then received a message saying “Meanwhile inside...” and was then given a view of the shopkeeper admiring his latest trade, a severed finger! So it appeared that the second suspect had either sold or traded the finger that was removed from the mutant they’d murdered on the boat to the shopkeeper. The plot thickens! Let's hope this finger doesn't make up part of a larger collection! I pixel hunted this screen about five times. I feel like I was supposed to be able to do something, but couldn't! 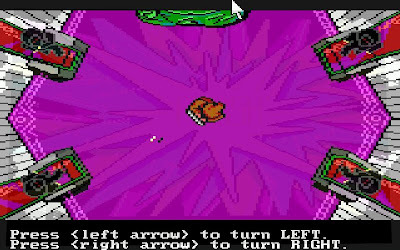 Strangely, despite pixel hunting the screen over and over, I could find nothing that I could interact with and I had nothing that I could use with the shopkeeper either. How was I supposed to play this game? For the third time in a row I was simply going to have to take the information I’d gained through my visit and move on. I opened the tracker once again, waiting to see where the suspect and his new accomplice went next. They travelled quite a ways north-east before stopping at the Transamerica Pyramid. The building had three markers moving around, and all of them were in the shape of an S. I had no idea what they could represent, and was still none the wiser when the two suspects rapidly moved towards one and appeared to grab it. They made their way back out of the building with the S in their possession. There was no point trying to figure out what the S’s represented by looking a tracker. I closed the recording and made my way over to Transamerica Pyramid! Oh look! There's a few S's over there. Quick, grab one! The building itself was unsurprisingly in the shape of a steep pyramid, and there was something that looked like mud falling from its peak. The building next to it was almost entirely covered in the brown material too, but my pixel hunting revealed nothing apart from the pyramid entrance. Clicking this entrance took me to a close-up view of the building’s front doors, and there was a broken chain sitting near the doorway. This reminded me of the chain snips I’d seen for sale at the shop, so perhaps the suspect traded the severed finger for them so that they could unchain something (or someone) here at the pyramid? I entered the building proper and came across a rather strange sight! 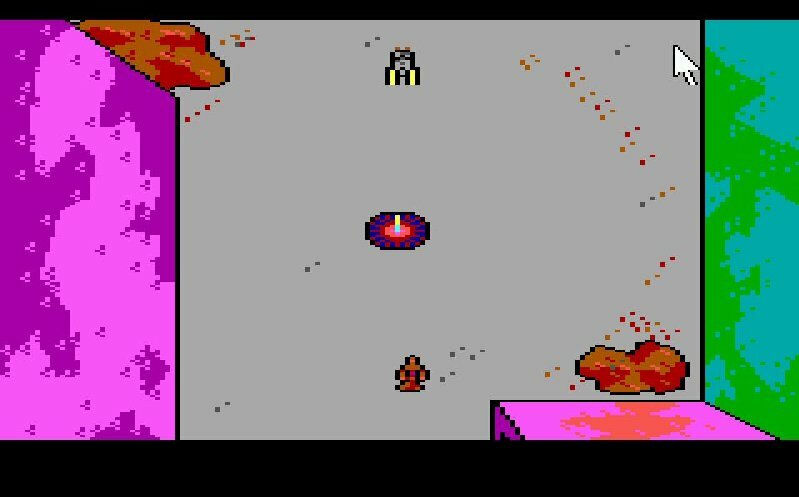 The pyramid seemed to have been turned into a mine since the Orb invasion, and a guard robot was currently punishing a slave by constantly zapping him. The S’s I seen in the tracker recording must have represented slaves! What really drew my attention in this scene though was a large gun locked away in a glass cabinet on the wall. My curiosity got the better of me, and I tried picking it up. This broke the glass, but I was able to get the gun (which turned out to be empty), setting an alarm off in the process. I then watched as my manhunter made his escape back out the front door unopposed! When I re-entered the mine, I was able to go further inside, which kickstarted yet another arcade mini-game. 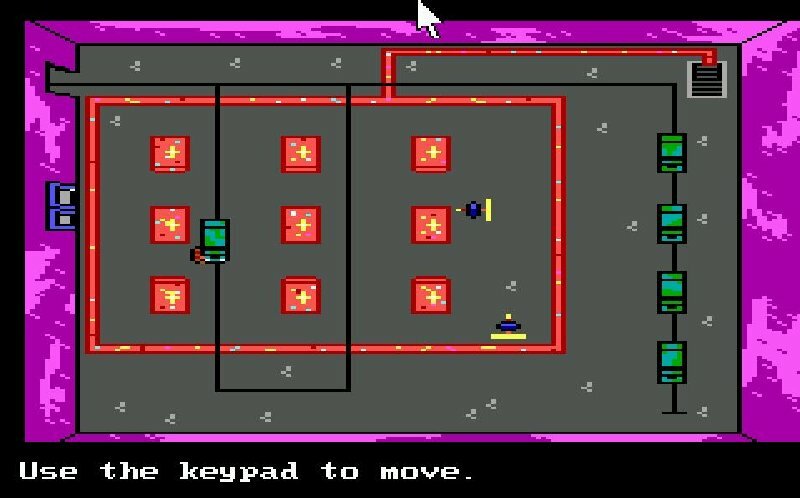 I was shown a top down view, with my manhunter positioned at the bottom of the screen, a slave at the top, and the laser firing robot positioned in the centre of the room. 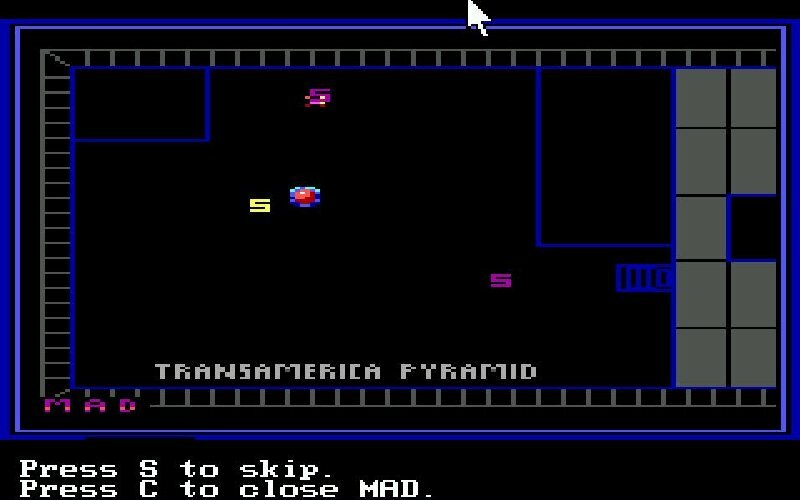 As I tried to dodge the lasers, the slave at the top would move in the opposing direction, but I couldn’t last long without getting zapped. When I first got killed, the Murry’s appeared on screen and said “this robot is quick, but there is a trick.” It didn’t take me long to figure out what it was too. If I moved as fast as I could in either direction around the robot, it would play catch-up and fire just behind me. 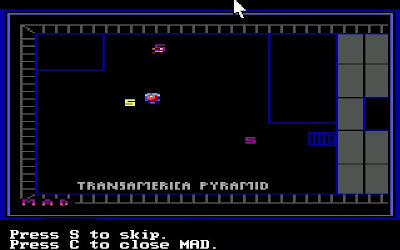 Meanwhile the slave was able to move all the way around behind the robot and make an escape at the bottom of the screen. I followed shortly afterwards, and watched as the slave left the building. I was given a close up view of his particularly yellow face, and then both of us ran off in different directions. I’d kind of expected the slave to join up with me, so was surprised to find him disappear without any communication or reward. I can only assume that he will make a cameo at a later stage in the game. You better come back and help me later little buddy! 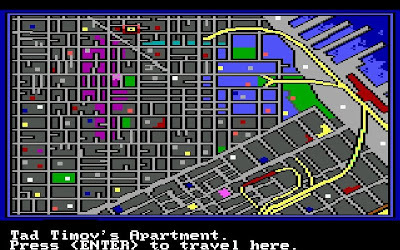 I turned to the tracker again and watched the two suspects and their slave leave Transamerica Pyramid and make their way quickly to a building titled “Dr,’s House”. Here they appeared to knock on the door, and when it was answered, they left the slave and departed. I closed the MAD and raced over to the house, which turned out to look awfully like something Norman Bates would thoroughly appreciate. Inside was a scene reminiscent to the hospital scene in Manhunter 1. A blue body was lying on a table motionless in a room filled with medical books and implements. I took a closer look at the body and found it had been badly mutilated. Not only was it missing its right arm from the elbow down, it also had a P carved in its forehead and an S on the left forearm. Could this be the slave? Did they really save him just so they could kill him for some evil purpose? Why did he take his arm? Or was that why he was brought to the doctor in the first place? So many questions! Putting my cursor on the P revealed it had been “carved with a dull knife”, but the S gave me no such information. 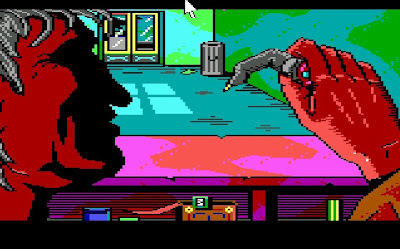 This all reminded me very much of the first game and in particular the body hanging in the closet. 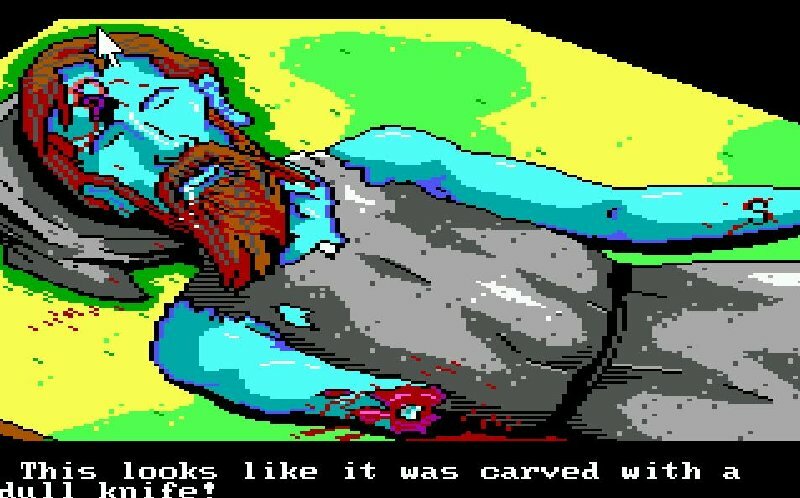 I looked back at my screenshots of that game and found that Phil was carving P on his victim’s foreheads. Did Phil kill this man or merely mark him as his own while he was a slave? 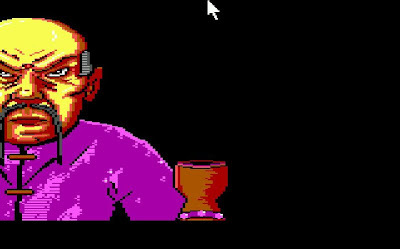 The answer came quickly, as when I checked out the back room of the doctor’s house, I found the doctor himself slumped across a table, also with a P carved into his forehead. So Phil was back to his old tricks again! At least now I knew that my current path was connected to my old foe. Also on the table was a urine sample, although I wasn’t able to pick it up. 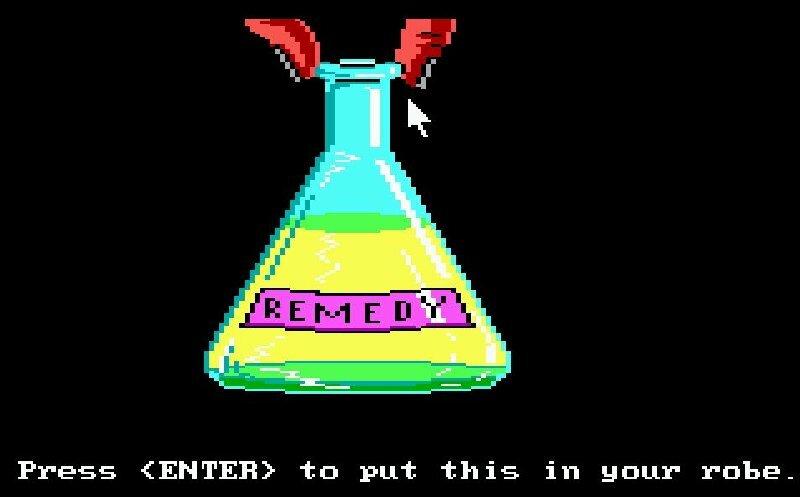 Its relevance wasn’t immediately obvious to me, but I thought I would just try using the remedy flask on it and it worked! So now I had some urine! Um...awesome! This note is entitled Letter 2 in my inventory. Where is Letter 1? Did I miss it? Please don't answer this. Yes, I've got it! It's Mic Stone! You're puzzle cannot defeat my genius! ﻿I felt pretty good about myself at the end of my last post. Just when it looked like I was going to reach the end of my tracker recording investigation, I’d solved a puzzle that revealed one of the suspect’s names. 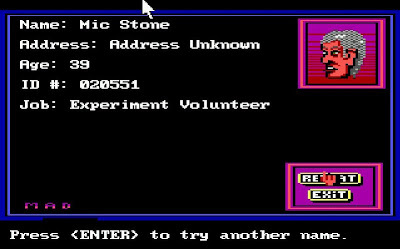 What I hadn’t realised at the time was that Mic Stone’s profile didn’t have an address, meaning my next game session started with a bit of a letdown. All I knew about the guy was that he was aged 39 and that he worked as an Experiment Volunteer, and while that would explain why he ended up in the state in which he died (having transformed into some sort of mutant and then committed suicide), it didn't give me the lead I'd thought it had. I expected to be able to rush on over to his apartment and continue looking for clues, but instead I was going to have to look over everything that had happened so far, and try to figure out what I was supposed to do next. OK, so I'll just pop over to Mic's house and...oh...damn! I knew I wouldn’t be able to figure out everything that was going on in the tracker recording, but I tried my best. Two men, one of whom was Mic Stone, entered the Bank of Canton and killed Tad Timov (a member of some sort of Dragon gang). They took something from the safe in Tad’s office and appeared to have killed him by taking a large chunk out of his neck. On leaving the bank, they were confronted by another Dragon gang member, who they also killed by doing some serious damage to his throat. I discovered a large fang in the wound, suggesting at least one of the murderers was a mutant of sorts. The two then made their way to a warehouse containing crates of human body parts, where they fought each other and separated. One of them (not Mic Stone) was badly injured and made his way through the warehouse into an office. There he wrote a message in blood on a table that appeared to have been directed at someone named Zac. The message informed Zac that Mic was a traitor and that he could be located at a location called “den”. Did Zac write this or was it written to Zac? I can’t be certain which one the men ended up with the item from the safe. The message on the table says “me got it”, but it doesn’t say whether Mic stole it from him in the scuffle. I can only assume that he did, and that his motive for the fight was to steal the item and flee. The second man then left the warehouse and entered a pipe at the Hyde Street Pier, which I assume is where this “den” place is. Mic Stone on the other hand made his way from the warehouse to the Ferry Building, where I’d seen Phil Cook land his craft during the introduction. He entered a room there briefly before leaving, but I’ve not been able to figure out what he did there. I’m going to guess that he handed over whatever was stolen from the safe to Phil, but I could be way off the mark. Either that or he collected the bottle titled “remedy”, but it's most likely both. 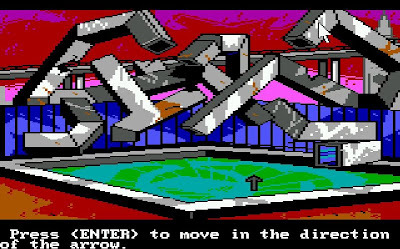 Either way, Mic then went into a hidden room underneath the Embarcadero Fountain and then appears to have killed himself using the “remedy”. I can’t be sure whether he meant to commit suicide or not, but my gut tells me he received the remedy as a trade for whatever was in the safe, but didn’t realise it was poison until it was too late. Suicide or trickery? Perhaps time will tell! Even if the above assessment was right, which I highly doubted, I couldn’t deduct from it what I should try next. I spent a bit of time looking at the “clues” I’d collected in my inventory, but none of them gave anything away either. Both the newspaper clipping and the fang suggested mutants were involved in the plot, and while the Dragon note seemed important, I couldn’t think of anywhere that “The R3 is the L1 to R4” might apply. It did dawn on me that the L could represent left and the R’s right, but I locked that away to memory for another time. That left the laundry receipt, the empty flask, the mallet, and the strange cloth with the words “rub jewel of heaven” to ponder over, but I still came up with nothing. All I could do was leave Mic’s place of death and revisit the various locations on the map in search of something I’d missed the first time around. However, on leaving the location, I was suddenly saved from my perplexity! The Orb’s contacted me! I've never been so happy to be contacted by human-eating alien Orbs! 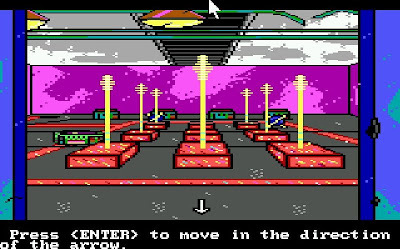 As in the first game, where the Orb’s would override my MAD at the end of each day to demand I hand over any rebellion names I’d uncovered, the same occurred here. “You have had sufficient time. Report suspect’s name...” I was then asked to enter the names of both suspects, although I only knew one. I typed Mic Stone and then Tad Timov for the second one, although I knew the latter was wrong. “Your reply is being processed. Return home immediately. Wait there for further orders.” I then found myself in Peter Brown’s apartment, which no doubt will be mine for the duration of the game. I was seen hopping into the hammock and going to sleep. 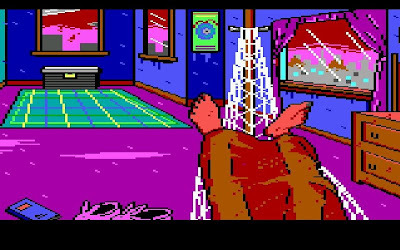 I couldn’t help noticing the pink bunny rabbit slippers next to the hammock, which were a humorous touch in a very dark game. Aaahhhh....I could get used to being Peter Brown! 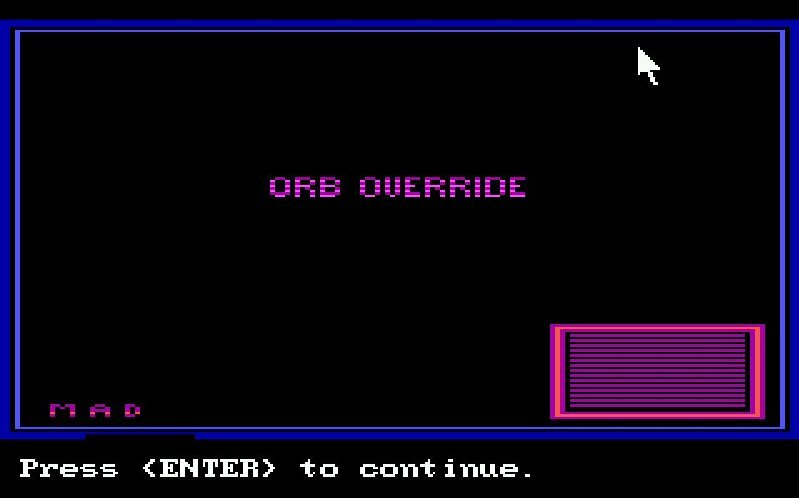 Next thing I knew it was Day 2, and just as in Manhunter: New York, an Orb paid the apartment a visit to give me my instructions. 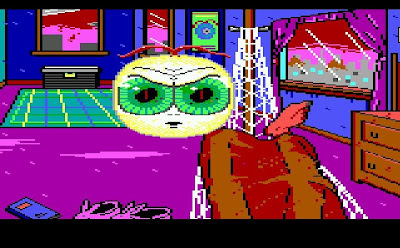 While I’d noticed it in the introduction, it was now clearly apparent that the Orbs have two eyes, a nose, and a mouth in this game, whereas in the first game they were basically just floating eyes. I’d wondered how they were communicating with me previously, let alone eating humans, but now I could watch the Orb’s mouth move as it spoke to me. 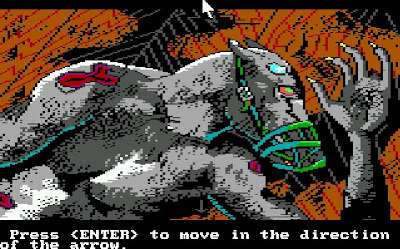 “Attention Manhunter! Boat burning on Pier 5. Investigate.” With that it was gone and I was able to view a whole new tracker recording on my MAD. I have no idea whether there is a trigger that causes the end of Day 1. I doubt it would be time related. Maybe the day ends as soon as you’ve visited every location? Or perhaps you literally have to have done everything you can with the clues available to you? I couldn’t help hope the latter, but once again I doubted it. Actually, Peter's life seems awfully similar to my own! Once again I planned to watch only short snippets of the tracker recording and visit each location as it is uncovered, and once again there were two suspects to follow from the outset. These two suspects walked out to a boat at the pier where someone was situated, and they appeared to have fought and killed him. They left the scene, but I immediately closed my MAD and pulled up the map to pay the pier a visit. On arrival I found a burnt out boat and since there was only one part of it that I could take a closer look at, I did. In the boat I found another dead werewolf looking creature, although this one had a muzzle on it. I picked up the muzzle and knew immediately that I would be able to use it at Tad’s apartment to get past that damn dog. Before I rushed off to do that, I investigated the corpse as thoroughly as I could. All I could find was that the creature had a broken fang and a missing finger, the first of which led me to believe that this was the body of Day 1’s second suspect. Did they put the muzzle on him when they attacked or was it just a fashion accessory? I had no idea what the missing finger meant, but putting my cursor over it revealed that “the finger hasn’t been gone long”. So the two new suspects killed the creature for the finger? I was eager to go find out, but before I did that, I simply had to see if the muzzle would work at Tad’s apartment. I made a beeline straight for it and entered. Within a few seconds the dog came at me, but I was ready with the muzzle and locked it over his head (the game did this without any interaction from me). It then ran back into the fireplace, leaving me to explore the apartment for the first time. 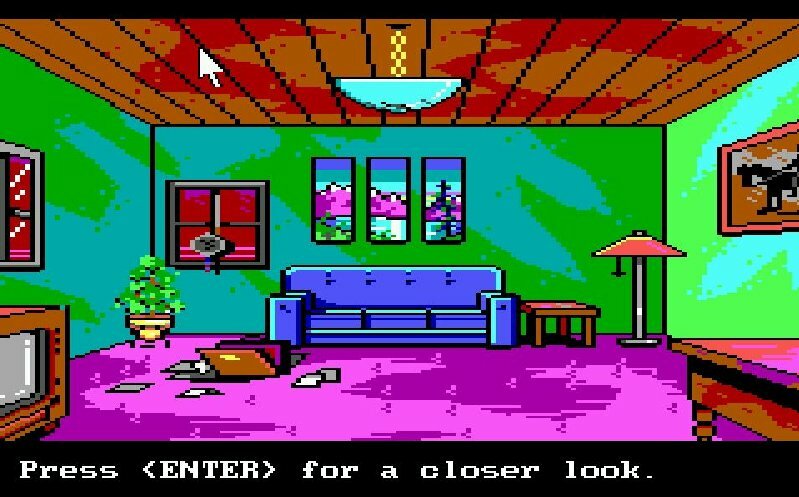 I pixel hunted the room as well as I could, and came up with two very interesting things. Firstly, I found a banner on the wall with the words “HEAVEN” and “VISION” on it. Next to each were symbols made up of three lines, although the symbol next to VISION had an interruption to the middle line. What did it mean? I remembered the message on the cloth (“rub jewel of heaven”), but couldn’t see what relevance the symbol might have with that. I wasn’t able to pick up the banner, so clearly its content was all that mattered. Why does everyone in this game just keep cryptic messages lying around? The second item of interest in the apartment was a camera I picked up off the bench. Looking at it revealed that I could press a red button, so of course I did. 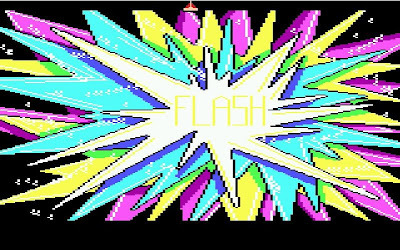 A bright flash filled the screen after which I was informed by the Murry’s that I’d “just used your last flash!” I was still able to play after wasting the flash, so I’m not sure whether or not it’s completely necessary to complete the game, but I restored just in case and this time picked up the camera without using it. I tried to think of a location I’d visited previously where the camera, or more specifically the flash, might be useful. The only one that came to mind was the pitch black pipe at Hyde Street Pier where the giant rat had eaten me previously. 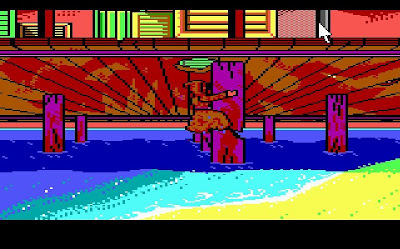 I made my way to the pier to see if I was once again on the money, but no matter what stage I used the flash when looking through the pipe, the creature always ate me. I therefore opened up the tracker recording to see where the suspects went after setting fire to the boat, and was surprised to find that they separated shortly after leaving the pier. One of them entered a building called “The Temple”, where they appeared to move towards one of four thrones and then disappeared, so I set off to find out what happened. 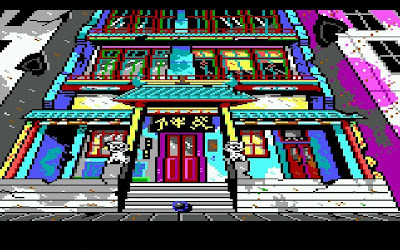 When I arrived at the temple, I found I could enter the rather colourful building or I could go to the right of screen to another location. I chose to enter the temple, and soon found myself in the room with four thrones. In the middle of the room was a shield lying on the ground and since I didn’t seem to able to do anything else, I picked it up. Black spirit-like beings appeared on each of the thrones and began throwing things at me. 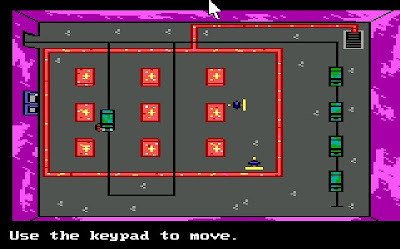 I could use the left arrow to turn left and the right to turn right, and the aim of this little arcade mini-game was to block the projectiles with the shield. 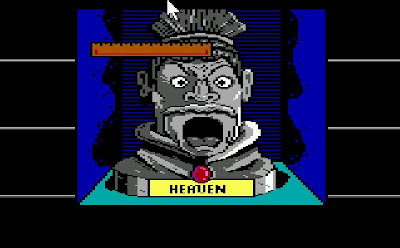 At first it was very easy, but then it became very difficult indeed, with stacks of high paced projectiles flying at me from all angles! So now there are aliens, werewolf mutants and dark spirits? This ain't science fiction no more! It took me a few goes at it, but I eventually managed to block all of the incoming projectiles, after which the spirits disappeared. My view then changed and I watched as the large green Budda-like statue rose up into the air to give me passage to a staircase beyond. Strangely, the tracker recording had implied that the suspect had sat on one of the thrones and then disappeared, but I was given no opportunity to investigate them further. I doubted that one of the suspects was actually a spirit, so maybe I was just supposed to assume that they made their way past the statue and up the stairs. 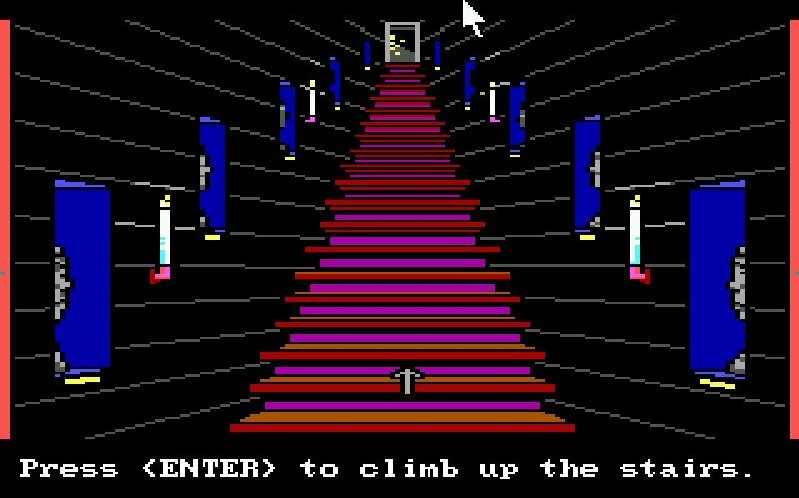 I clicked on the staircase, and was then shown a view of it, with statues and candles on either side. I found that I was able to look at the statues, and that each one had a single word on a plate at its base. In clockwise order they were Gateway, Heaven, Truth, Freedom, Earth, Bridge, Hell, Castle, Balance and Action. Reading these gave me two “eureka” moments! No, that's not ominous at all! Firstly, the note I’d picked up in Tad Timov’s office had said “The R3 is the L1 to R4”, and the staircase seemed a perfect place to apply the Left and Right idea I’d had at the beginning of this session. I took at look at the third statue on the right, then the first on the left, and then finally the fourth on the right, hoping to make sense of the cryptic message. Taking the words from each statue, the sentence formed “The Castle is the Gateway to Hell”! In case there was any doubt that I’d uncovered something important, the Murry’s appeared onscreen with a message of their own. “OK, you figured that one out, but what does it mean? ?” They had a point too! As happy as I was to have solved that, the solution didn’t mean much to me. I’d certainly not come across anything resembling a castle so far in the game. You couldn't just let me enjoy my minor victory could you!? 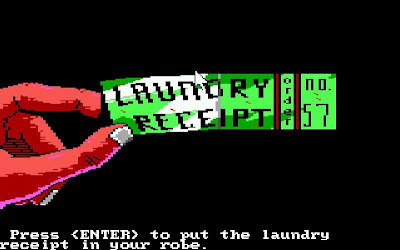 The second success I had at the staircase was to do with the cloth I’d picked up in the manhunter’s apartment. On it was written “Rub jewel of heaven”, and I was able to do exactly that. Rubbing the cloth on the jewel in the statue entitled “HEAVEN” caused the statue’s eyes and mouth to open! I have no idea how exactly the message was communicated to me, but I was shown the letter F, followed by what looked to me to be an oar, then the letter P, and finally what I gathered was a ruler. What was all that about? If it was indeed an oar then putting an F in front of it would produce “foar”, which could represent "for" or "four", but doing the same for the P and ruler would make “pruler”, which clearly didn't mean anything. Hmmmm...this one was going to take some thought! That’s probably enough information for one post, so I’ll stop here. Things could change quickly, but I’m still enjoying the game and still have quite a few leads to follow and puzzles to dwell on. Will the next post be where things start to turn pear shaped? Settle down man! How could I have known that you had a metre rule? I wouldn't want to lose this. "That robe over there! Yeah, the brown one!" 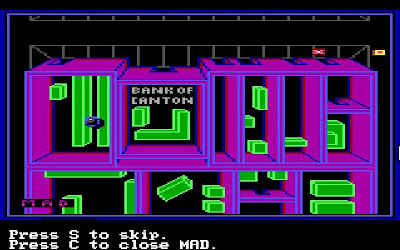 My first Manhunter 2 gameplay post had covered only as far as the Bank of Canton. 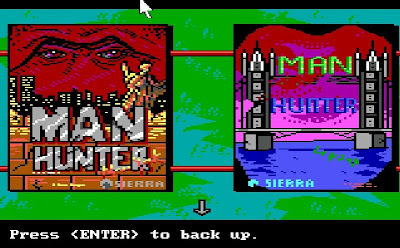 I felt like I’d found everything I was going to find there, but then my experience with the first Manhunter game told me that was likely a false sense of security. 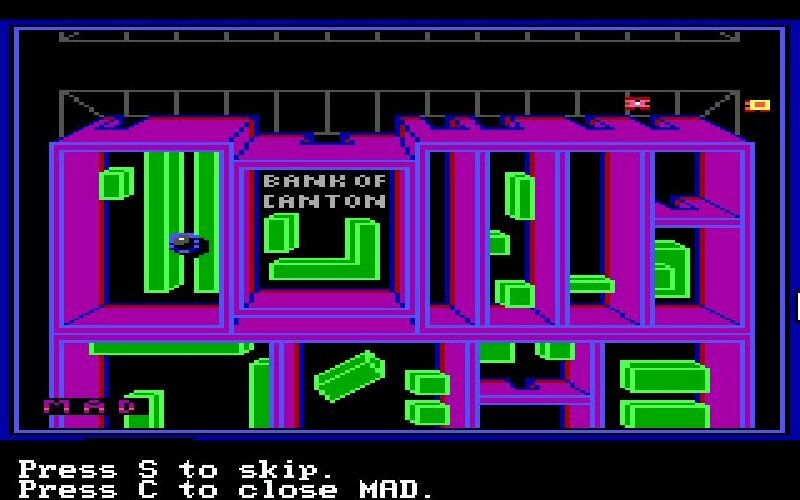 Still, I felt ready to open up my MAD and see where the suspect travelled next after murdering Tad Timov in the bank and a second Dragon member on the pavement outside. I opened up the tracker and watched as the suspect left the bank area and travelled north east until they arrived at a warehouse. Its here that something surprising happened which made me realise I’d been misinterpreting things during my first game session. I’d questioned why the suspect’s marker in the tracker recording was both red and yellow, and it turns out I wasn’t looking at a suspect at all. I was looking at two suspects! I figured this out when the red and yellow markers got into a scuffle (at least I assumed that’s what happened) at the warehouse entrance and then went separate directions. 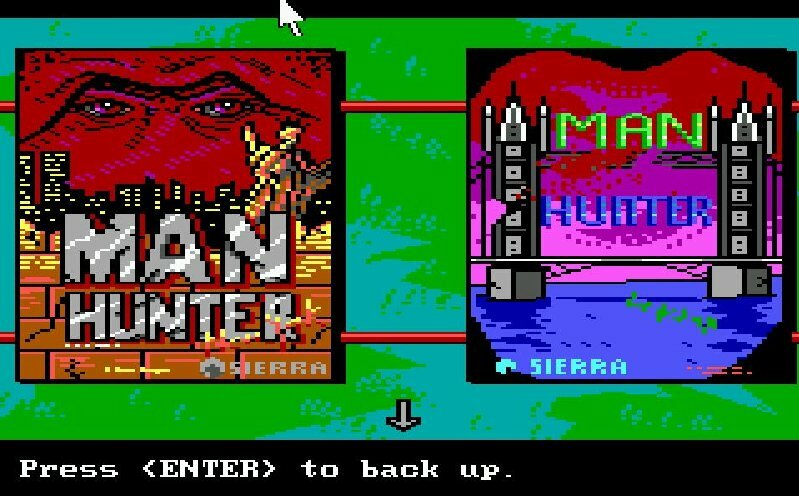 It’s at this point that I also remembered that I was able to change which marker I was following in Manhunter 1 by clicking on them, and the same applied here. The yellow marker was simply the city occupant I was following at the time! So now I had to decide whether to follow the suspect that entered the warehouse or to remain focussed on the other one that left the area. I decided to follow the suspect into the warehouse as that location would already be marked out on my map. I watched as they weaved their way through the warehouse, paused in a small room in the bottom left corner, and then made their way back out of the building. What did they do there? Time to find out! As soon as I opened up the map screen to look for the warehouse I noticed a flashing yellow marker that hadn’t been there before. I moved my cursor over it and was surprised to find it was Tad Timov’s apartment! Of course! 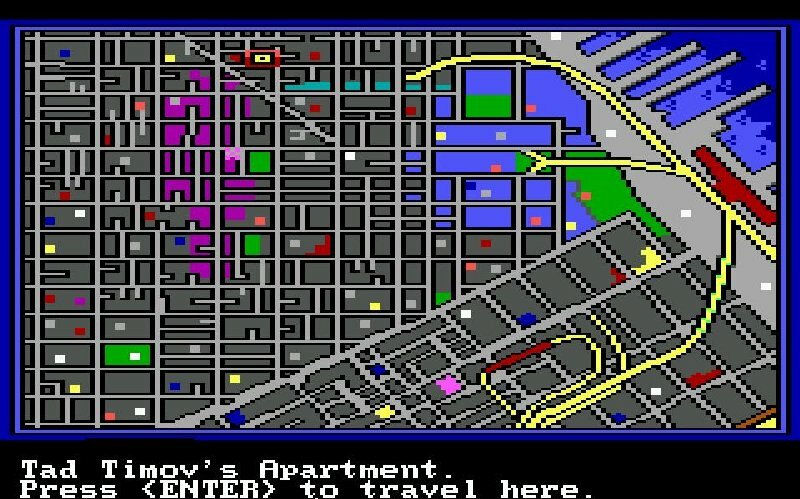 I’d forgotten that discovering addresses of city occupants in Manhunter had then made their homes available to visit on the map screen. Since I’d found Tad’s profile on my MAD, I was now able to visit his apartment. I thought Bat Vomit would have a cave somewhere! I decided to visit Tad’s apartment before checking out the warehouse. It’s safe to say that Tad didn’t live in the nicest part of town, with strip clubs and graffiti covered buildings all around the entrance to his abode. I could find nothing to do apart from entering it, so that’s what I did. I got only the briefest glimpse inside before a vicious dog appeared in the fireplace and then charged at me, knocking me to the ground. The Murry’s then appeared to inform me that what occurred off screen was so disgusting even they wouldn’t show it! I restored and entered the apartment several more times, thinking I might be able to use an item in my inventory or find something in the room and get out before the dog could attack, but every attempt ended in my death. I figured I was missing something I needed to distract the dog, and therefore moved on to check out the warehouse. I entered the warehouse on arrival, as I could find nothing else to interact with outside. Once inside I came across a rather disturbing site. There was a large container with what appeared to be body parts swirling around in it. On the side was written four different types of “cuisine”, being face filets, flesh fries, finger food and poopsicles, and since flesh fries had an asterisk next to it, I could only assume that’s what I could see within this particular container. On the floor in front of the container was a “bloody clumpy of coarse hair”, which I figured must have been a result of the scuffle I’d witnessed on the tracker recording. Since I appeared to be able to do nothing with either the container or the hair, I moved on past it into the warehouse. 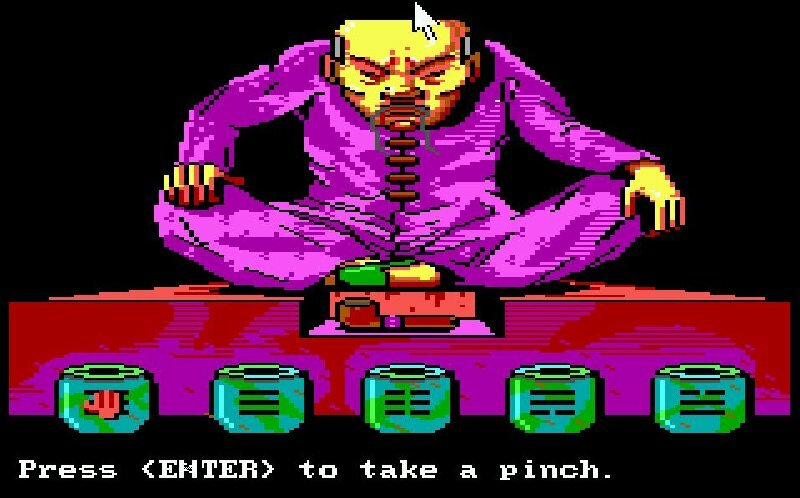 Here I faced my first arcade mini-game in Manhunter 2. There were four robots roaming the container filled room, and my goal appeared to be to reach the door at the opposite end while evading them. It was made more difficult by the fact that the robots rapidly approached me if I ever got within their “line of sight”, so the trick was to hide between crates temporarily and to time my movements precisely. It took a while (I got crushed numerous times), but I made it through! It's like Pac-Man...but with robots and crates of body parts all over the place! The small room that the suspect entered briefly turned out to be an office. There was a large mallet leaning against the wall, which I was able to pick up. There was a schedule on the wall that read “Experimental station needs 5 crates – no New York shipment. Can’t make contact.” I’d noticed that the crate containing the flesh fries had New York written on it, but I couldn’t make any sense out of the schedule otherwise. The only other thing of interest I could find in the office was a message on the table written in blood. “Zac – me hurt me got it. Traiter mic me at den” What does that mean? Whose Zac? What did he get? Is Mic short for Mike? Is he a traitor? What’s the den? Why did the suspect come into the warehouse? Was it just so he could leave this message for Zac? So many questions! No answers! Tucking all this away into memory, I left the office, made my way back through the arcade mini-game (eventually) and left the warehouse. I opened up my tracker to see where this injured suspect went next, and the answer turned out to be Hyde Street Pier. It seemed from the recording that they climbed down a ladder at the pier and entered something in the side of the wall. This is where the target signal was lost and the recording terminated. I opened up the map screen and set out in a north-west direction towards where I expected the pier to be. 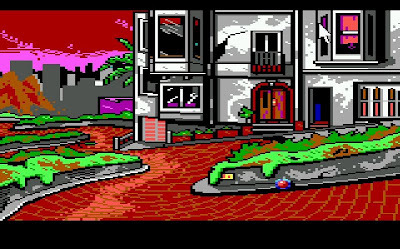 Once again I came across a flashing yellow marker that I hadn’t expected to find, and this time it turned out to be the manhunter’s apartment! There was no address that I could see on Peter Brown’s ID card, nor had his profile come up on the MAD. I can only assume it was on the back of the card. Regardless of how I know the address, I decided to check out the manhunter’s pad before paying a visit to the pier. Thankfully there was no dog waiting for me inside, so I was able to look around. Out the window I could see “The Transamerica Pyramid” and “Coit Tower”, but I could find no real purpose for being able to do that. However, inside one of the drawers I found a piece of cloth with a Chinese symbol, two fish and a ying yang symbol on it. It also had a note attached to it that read “Rub jewel of heaven”. I picked up the cloth, but had no idea what it could possibly be useful for. There was nothing else of interest in the room, although putting the cursor on the hammock informed me that “it is too early to go to bed”. 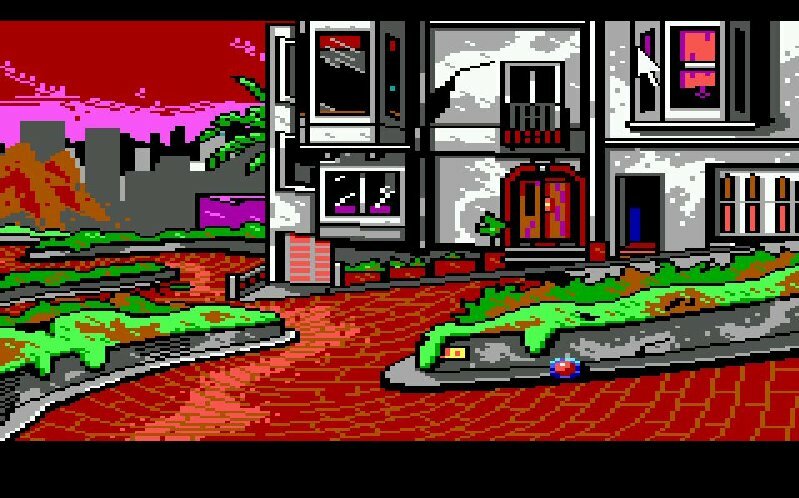 I can only assume that at some point I’ll be coming back here to sleep the way I did in Manhunter 1, although on that occasion the apartment was my own. I left the apartment and made my way north to Hyde Street Pier. I ain't rubbin' no jewels of heaven man! The pier not only had the ladder going down to the beach, it also had a storage area behind a metal fence and a large ship docked close by. I was able to get a close up of the fence and some of the crates within, but didn’t seem to be to interact with any of it. Perhaps I’ll be able to cut the fence at some stage? The box closest to the fence had Medical Supplies written on it, but there seemed no way to open it or move it. I climbed down the ladder the way the suspect did and my view changed to a third person perspective. 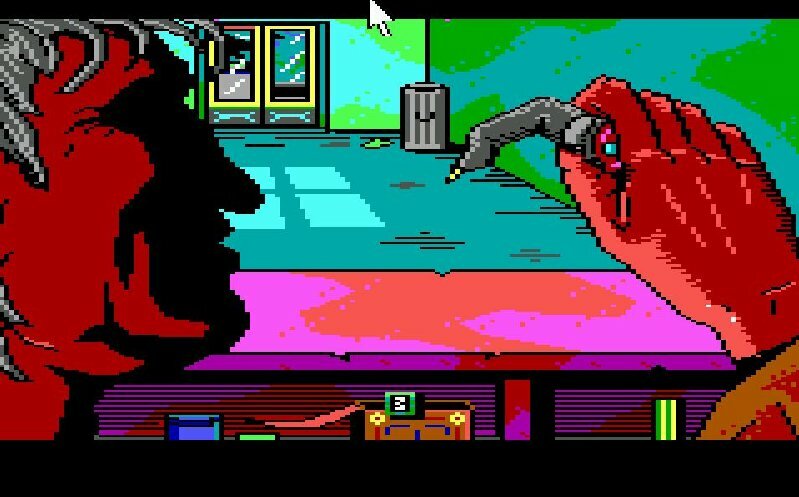 The pipe coming out of the wall was clearly where the suspect went when they disappeared off the scanner, but the blood dripping out of it suggested it wasn’t a great idea to climb in. Still, you never know if you never go, so I saved my game and hopped inside. 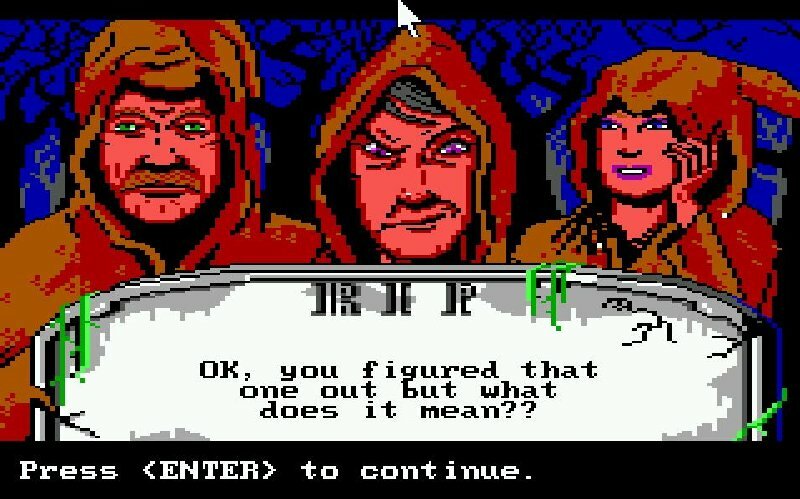 Moments later a creature with large teeth killed me on the spot, spitting out my robe and a couple of the larger bones. 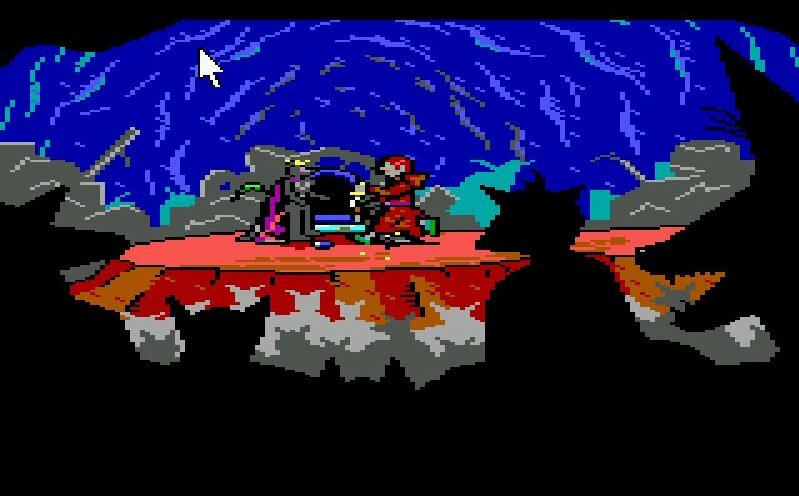 Interestingly, the game over screen read “you should let a sleeping rat lie!” Was that thing actually supposed to be a rat? Perhaps it was a mutant monkey-rat!? I know! I'll just stick my head into this pipe that has blood flowing out of it! 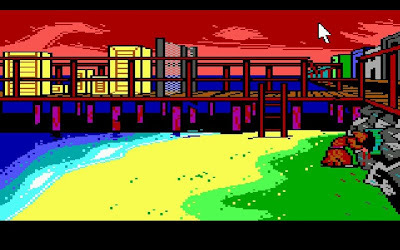 Before leaving the pier, I did one more thorough pixel hunt. I found something too, which was that I could interact with one of the pillars beneath it. Pressing the magnifying glass on it caused my character to wade through the water and climb most of the way up it. My perspective then changed back to a first person one, and I found myself staring up through a hole into the storage area. Sadly, one of the crates was sitting on top of the hole, so I wasn’t able to climb up and explore. I’d already tried using items such as the mallet on the crate while looking through the fence, and I tried again here without luck. In the end I had no choice but to open up my MAD to see where the second suspect went after the warehouse. I’d followed the first suspect as far as the tracker recording went, and had literally run out of things to try along that path. Hopefully following the other path for a while would give me some answers. Somebody help me! The brown will run straight out of this robe! Cranking up the MAD again, I soon found out that the other suspect made their way over to the Ferry Building, which is where Phil Cook was seen landing his alien craft in the game’s introduction. They paused temporarily near the entrance before entering a room, where they paused again, then left the building altogether. I opened up my travel map, and found the Ferry Building to the east. 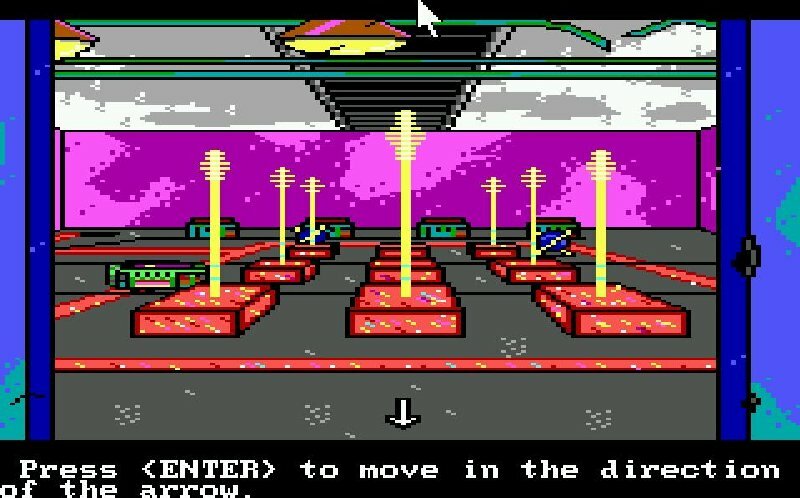 Once there I found I was only able to enter the building as nothing else on the screen gave me any interaction features. Inside was a staircase leading up to three sets of locked glass doors. 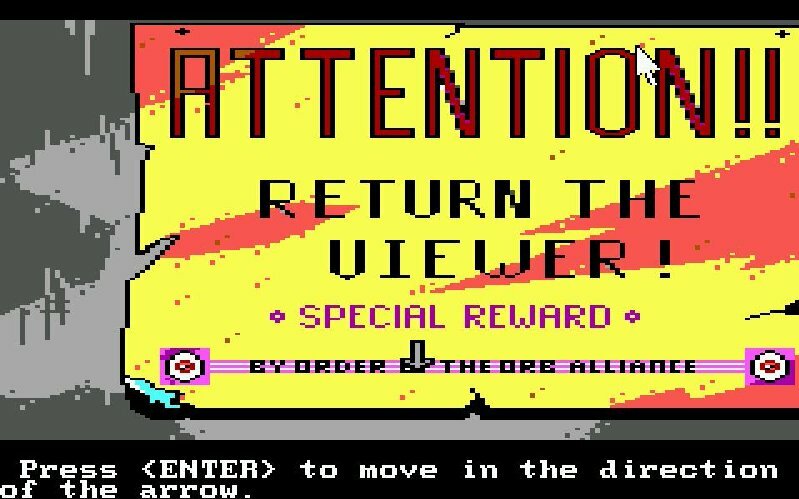 I thoroughly pixel hunted this screen as the suspect seemed to enter a room to the left, but I couldn’t find anything other than a sign saying “Attention!! 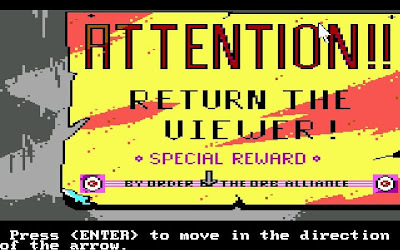 Return the Viewer! Special Reward. By Order of the Orb Alliance” It seemed to me that the suspect had paused in front of this sign before entering the room, so I spent quite a bit of time trying things in front of it. 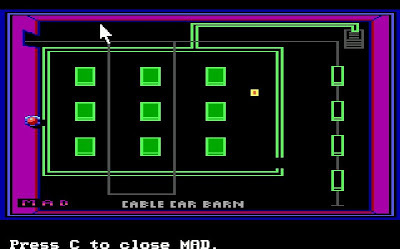 I thought maybe Tad’s note (“The R3 is the L1 to R4”) might have something to do with it, but I couldn’t find anything in the message. Eventually I had to admit defeat and moved on. I can only imagine how "special" that reward would be. So where did the suspect go after the Ferry Building? The answer is some place called Embarcadero Fountain. The odd thing was that once they arrived there, they spun in a circle around a central point before entering a short passageway (of course I was watching this on the tracker recording). Once they reached the end of that passageway, the tracker recording stopped with a “target movement ends at this point” message. I suddenly realised that this was the only solid lead I had left as I’d not yet really been able to solve anything at all. There were no other suspects to follow so I really hoped something in the Embarcadero Fountain gave me another lead. I travelled there and found myself standing in front of a strange labyrinth of tubes and what looked like a square swimming pool. I clicked on the pool and watched as my character spun around a central point, just the way the suspect did, with the only difference being that my character disappeared down the little hole at the bottom to their death. Hmmmm…was I supposed to do something?! I don't know art, but I know what looks terrible! After a restore I noticed it said “Press <ENTER> to spinout” at the bottom of the screen, so I started pressing it. Apparently spinning out whilst descending down a slope causes you to move out towards the edge of the screen, so I had to try to time it just right so I’d spinout into the corridor off to the side. Not spinning out fast enough would result in me falling down the hole, but spinning out too much or at the wrong time would result in me launching out of the opening altogether. I made it after just a few tries, at which point I appeared in the corridor with a third person sideways perspective. There were controls at the bottom of the screen which described how to walk, punch and stomp, and I had to put them into use almost immediately. Bats began flying at my head and rats ran at my feet! Thankfully, punching and kicking them was very straight forward, and I reached the end on my first attempt. Why does everything want to eat me around here!? The room at the end of the corridor was a horrific site to say the least. There was yet another corpse lying on a mattress, yet this one was grey and rotting. There was a message on the wall that said “me be man again someday”, which matched the inkling I had that this creature may not have been entirely human. Pixel hunting the room revealed a driver’s license next to the mattress, which I picked up, hoping to find an address that I could go to. Sadly, the license was badly damaged; meaning only the last name of the owner was visible (Stone). I wondered whether I might have some first names to try alongside Stone in my MAD, but decided to check out the corpse before putting any thought into it. The creature lying dead was definitely not human, at least not anymore! 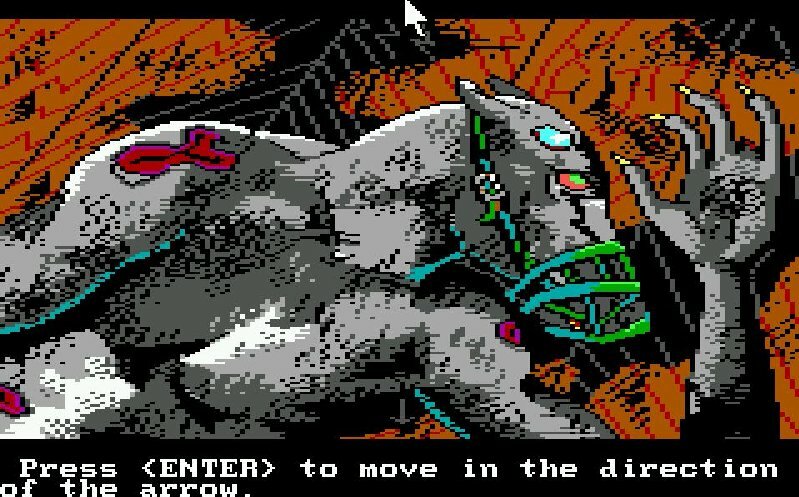 I immediately thought of the Mutant Pig-Monkey newspaper clipping again, but this thing looked more like a werewolf than anything else. There was a bottle next to its hand, which I picked up. Taking a closer look at it, the bottle said “REMEDY” on it, so combining this information along with the scrawl on the wall, it was pretty clear that whatever this thing was used the bottle’s previous contents to commit suicide. I’ll save my puzzling over what’s really going on in the recordings for my next post. 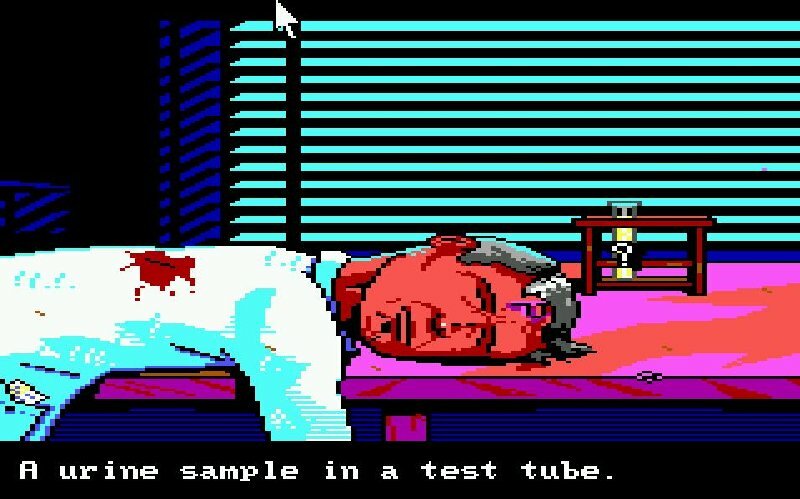 For now I’ll simply say that I’m enjoying Manhunter 2 as much as the first one so far. Possibly even more for the simple reason that I understand the game mechanics from the outset and can therefore focus purely on figuring things out. I’m yet to really figure out the meaning behind very much at all though and am conscious of the many comments stating how illogical the puzzles are, but for now I’m just going to try to enjoy the challenge. In fact, just now while I was thinking about what Stone’s first name might be, I managed to solve it! I’d tried Noah (from the newspaper clipping) and Zac (from the desk in the warehouse), but neither worked. That message on the desk seemed interesting though! “Zac – me hurt me got it. Traiter mic me at den.” Could the traitor be named Mic? It would make sense since whoever was lying on this mattress was the “person” that had a fight with the suspect that wrote the message. I typed “mic stone” into the MAD and it worked! It’s moments like this one that make me love adventure games! 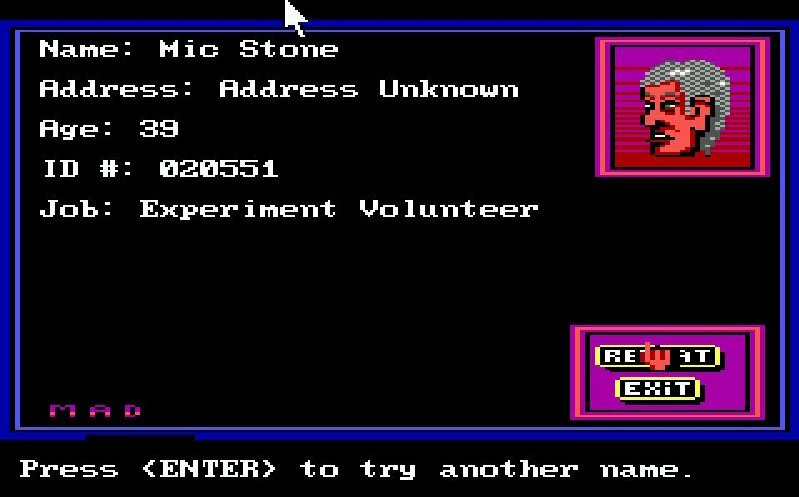 Um...Zac Stone?...uuhhh...Noah Stone?...hmmmm...Mic Stone! Yes! Damn I'm good!! It's hard goddamn work being this good!!!! 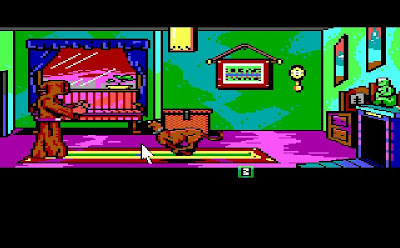 Game 29: Leisure Suit Larry III - Won!